As completely predictable as it was, it’s been nevertheless astonishing to see the speed with which many self-declared foes of Donald Trump have reversed their positions since he was elected president. Republicans and Democrats alike who warned against Trump in severest terms have been all too willing to backtrack for the sake of political expediency — or a potential cabinet position. Likewise, many of the major scandals that were poised to trip him up have fallen by the wayside. He settled the Trump University lawsuit with relatively little fanfare. It seems likely he’ll do whatever he wants as far as his business holdings are concerned. 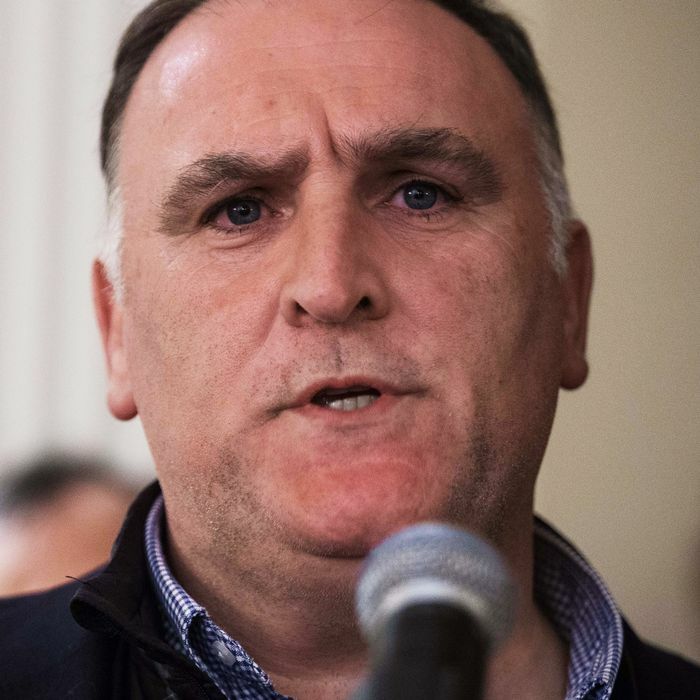 So it’s worth taking a closer look at the opponents who have not backed down, chief among them, the celebrity chef José Andrés, best known for restaurants specializing in olive-oil bonbons, “tomato caviar,” and foie-gras cotton candy. Andrés, born in northern Spain and raised in Barcelona, trained under Ferran Adrià at the acclaimed El Bulli, and now operates more than a dozen mostly Spanish restaurants in cities including Washington, D.C., Miami, Las Vegas, and Los Angeles. He’s considered to have been instrumental in helping to introduce and popularize concepts like small plates, tasting counters, and molecular gastronomy in America. His restaurants in D.C., where he’s based, — Jaleo, Bazaar, the Michelin-starred Minibar — have also played a huge part in elevating the city’s now-thriving food scene. Plenty of celebrities have been and continue to be vocal in their opposition to Trump, but most of them don’t have much at stake — at least not yet. Andrés, meanwhile, is in a very real legal battle against the president-elect. As has been widely reported, in 2015, shortly after Trump announced he would run for office and promptly made disparaging comments about Mexican immigrants, Andrés withdrew the commitment he’d made to open a costly restaurant in Trump’s new D.C. hotel. Trump, naturally, sued him for breach of contract, seeking $10 million in damages. Andrés countersued, arguing that Trump’s comments had completely destroyed the restaurant’s reputation and his ability to do business, long before it had opened. This stance is hardly out of character for Andrés. As the profile of celebrity chefs has grown, a number of them — René Redzepi, Dan Barber, Tom Colicchio, Roy Choi, Adrià, and especially Andrés — have used their platforms to explore the political side of fine dining, advocating for changes to improve the world’s food systems. Andrés has also been more than just a culinary ambassador. In 2006, he changed the name of his umbrella company from Proximo to ThinkFoodGroup. In 2012, he was honored as one of Time magazine’s “most influential people in the world,” categorized as an “activist,” and described by Anthony Bourdain as “capable of anything,” after he started an organization called World Central Kitchen with his wife, Patricia. Inspired by the 2010 earthquake in Haiti, its aim is to build kitchens in developing countries, to serve as a model for sustainable cooking using local ingredients and solar-powered cookstoves, and to feed people in crisis. One might wonder why Andrés — or Geoffrey Zakarian, the other celebrity chef to pull out of the hotel, who is also being sued — agreed to work with Trump in the first place; it’s not as though he hadn’t shown his colors before his campaign. 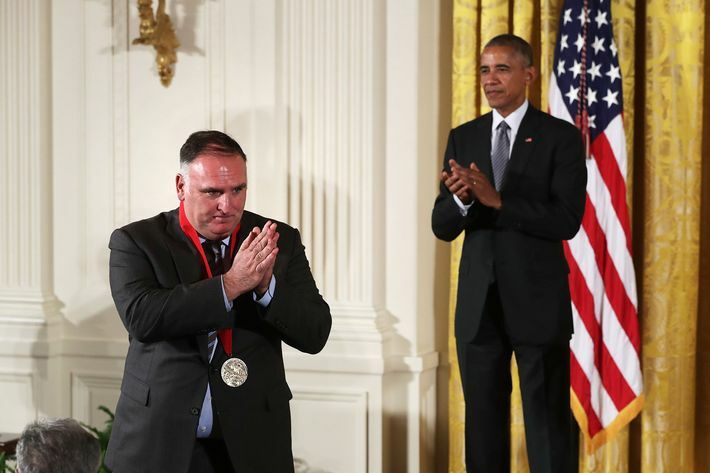 But chefs within the Trump orbit have in the past been able to maintain a certain degree of distance from their infamous landlord: Jean Georges, for example, Jean-Georges Vongerichten’s celebrated New York flagship, is in a Trump hotel, something few people seemed to notice or care about until Trump invited Mitt Romney there for the world’s most awkward-looking dinner. Now, Andrés has set a new precedent — for both chefs and Trump’s opponents in general.